In the U.S., less than five percent of pawrents have pet insurance. We all know how devastating unexpected veterinary bills can be on our budgets, and it’s even worse when we don’t have the insurance or funds to cover even the most basic care. Sadly, many dogs end up euthanized because of this. If you are caught in the heartbreaking situation of not being able to pay for your Tripawd’s care, please don’t give up. There are organizations who might be able to help. 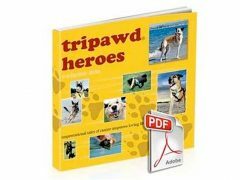 The following PDF is a list that was complied by a Tripawds friend, Nicole, Mom to Daggit and Vegas, with the hopes that others may be helped as she was last summer, when she needed it. Three paws up to Nicole! If you know of any that aren’t mentioned here, please let us know and we’ll make sure the list gets updated. 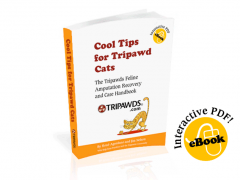 UPDATE: In addition to the financial assistance resources listed in the document above, members have shared the links below in the Tripawds Discussion Forums. Thanks for posting, Rene! I’m really passionate about getting the word out about these resources … it’s just heartbreaking to know that many owners can’t pursue the treatment their furbabies because of finances. As if these situations aren’t stressful enough, right? 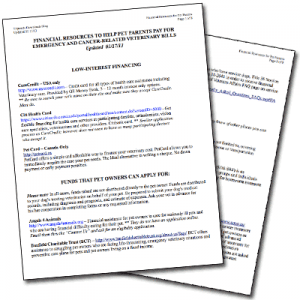 UPDATE: Visit this ongoing discussion forum topic for more canine cancer and amputation financial assistance resources. Hi Mary, I’m so sorry to hear about your sister and her pup. The resources you see here are the most current ones we know about, I hope she can find some help. If she would like to talk with others who have been through the amputation experience please have her join us in the Discussion Forums (of course you are welcome to as well). Good luck and keep us posted!